So the other day, my wife was searching Google for cupcakes in our area, she loves cupcakes. 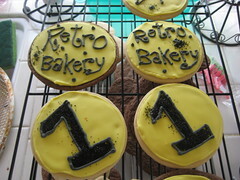 One thing led to another and 3 days later were stopping by Retro Bakery in the far Northwest part of Las Vegas…. we live in the Southwest part of Las Vegas… It’s a good 25 minute drive from our house. The good news is that it’s on the way to Mt. Charleston where our family has a cabin so we travel right by this bakery often. We have already been back 3 times for more cupcakes. They are an incredible mix of great cake and frosting, some are dipped in glaze like a doughnut, others have Buttercream. They just celebrated their first anniversary and gave away 1700 cupcakes, the event included a visit by a local news crew, (http://www.lasvegasnow.com/Global/story.asp?S=9823120). This past Saturday, which was Valentines Day, led to their best day ever. So why the success? Just great cupcakes? That helps, but I’m not so sure, if you take a quick look at their website you will notice that they have a blog, (2 in fact), profiles for Facebook, MySpace, Flickr, Zazzle, and Twitter. From the very beginning they started building a Tribe of cupcake lovers. They love their cupcakes and they love engaging others that love cupcakes too. Even though they are located at the last exit on the road to Reno, they have built a Tribe of cupcake lovers that don’t care. What’s really cool is that their online presence began using free tools, I’m guessing they didn’t spend a dime at the beginning to build their online presence, Blogger, Facebook, Twitter, MySpace and Zazzle are all free tools. The only thing required is some effort to get going and build your Tribe of fans around the thing you do. If it’s this easy, why don’t more people try it for their business? So how did I find out that Valentines day was their best day ever? Facebook.